Protest at Conga mine, October 2013. Work at Newmont Mining Corp.'s (NYSE:NEM), (TSX:NMC) majority-owned Minas Conga copper and gold project in Peru is likely to restart in the first quarter of 2014, government officials said Monday. NMe.com (in Spanish) reports that authorities of Cajamarca, the northern region where the mine will be based, met with over 30 community leaders over the weekend, with most of them allegedly saying they were in favour of the project. The group, however, said Newmont’s local partner Minera Yanacocha should meet certain requirements first, including assuring jobs and helping local businesses when possible. 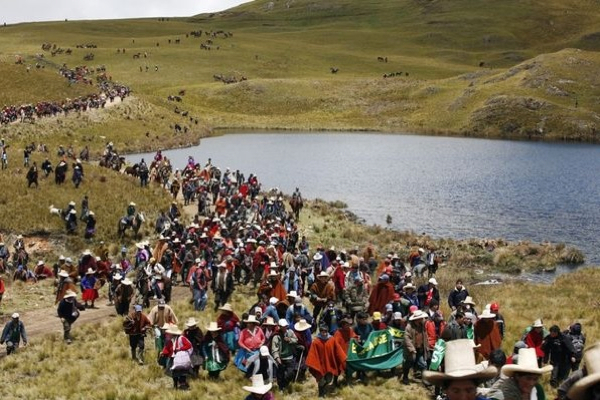 Newmont decided to halt Conga’s construction work in November 2011 after violent protests in the northern Peru region forced the government to declare a state of emergency. Social pressure continued all through last year, with Peru’s government hiring international consultants to report on report on the viability of the water strategy proposed for the Cajamarca region. The mine, which will require investments of $5 billion, is capable of producing up to 350,000 ounces of gold and 120 million pounds of copper per annum with a 19-year life of mine. If it goes ahead it’d be the largest-ever single private investment in the South American country. In a year-end television interview Sunday, President Humala said Peru is expected to see a record inflow of mining investments next year. He said new projects are anticipated to attract $14 billion next year, which would be an annual record for Peru.